We had Aubrey overnight and I quickly finished this off this morning before Lauren came to collect her… it’s just perfect for a 39 degree Brisbane Sunday. This unisex pattern was an old Kwik Sew that someone had given me. It is meant for knit fabrics but this is a cotton woven fabric from Spotlight. There were meant to be studs in the crotch but I dispensed with those as it is easy enough to do a nappy change by unfastening the buttons at the top. 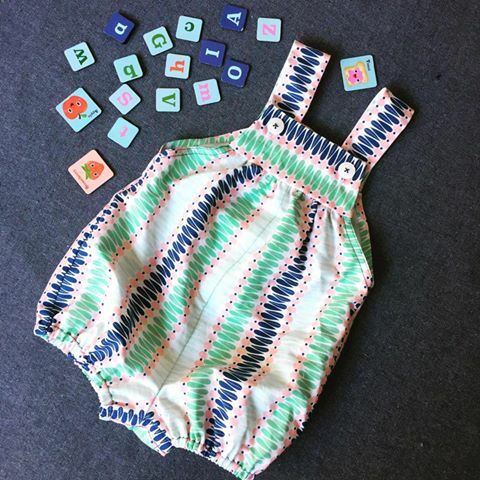 I love old school romper patterns… so practical for girls and boys in hot weather!